While the latter statement may be true in the short term, it wouldn’t remain so for long without SASS® - and Cowboy Action Shooting™ wouldn’t be the recognizable or respected discipline it is today in the Shooting Sports and Firearms Industry if it weren’t for the direct efforts of the Single Action Shooting Society®. At this critical time in our organization, I think it is important to illustrate what your membership in SASS means on a global scale- and list just some of the achievements SASS has championed on your behalf over the years. While being humble is an admirable quality, I think it is time to outline some of SASS’ accomplishments. SASS® membership means different things to different people, and membership in SASS has both tangible and intangible benefits. In many ways, those intangible benefits outweigh the tangible benefits of a registered alias, a shooters badge, and member discounts. Colt SAA’s and their clones would be illegal in California if not for the direct efforts of SASS on your behalf. Without SASS, members in California would only be able to have rifles that are limited to hold 10 rounds only. 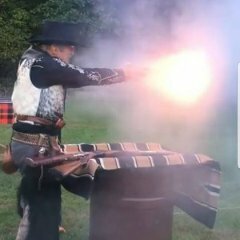 Today’s wide variety and availability of Single Action Revolvers and Lever Action rifles is directly attributable to SASS and its success as an organization. SASS created and still creates and maintains a visible market that influences manufacturers. There would never have been a need or desire for a .38 bullet weighing less than 158 gr. Winchester quit putting the cannalure in their .45 LC brass and made it a smooth walled case so it would last longer. The quality and design of those firearms is immensely superior to those of yore- and while that’s largely due to the efforts of Boyd Davis (EMF) and Val Forgett (Navy Arms), their efforts would’ve been fruitless without the visible market that is the SASS Organization of members. Many retail giants in the industry (Midway, Dillon, Cabela’s, Brownell’s) stock and market Cowboy Action Shooting accessories, parts, etc. – a direct result of SASS’ influence. Internationally, many countries are signing on to the UN Arms Trade Treaty. Those countries will be expected to conform to the mandates of the treaty. SASS stands as the organization that invokes protection to ensure that SASS members and affiliated clubs are protected by definition- meaning their guns are protected. SASS membership affords members in many foreign countries to possess firearms that they otherwise could not legally own. SASS has had a profound effect on the way firearms and the shooting sports are viewed by many, including the press. 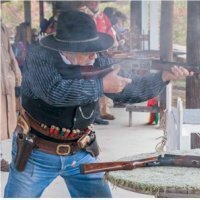 Men, women and children dressed in 1890s clothing, shooting old time firearms presents an aura of FUN. That in turn has influenced other shooting sports, which have adopted the public approach of “shooting is a FUN, SAFE, pastime.” Even the National Shooting Sports Foundation advertises their First Shots program with an emphasis on FUN. SASS has been a member of the National Shooting Sports Foundation since its inception, and has helped develop many of their range programs. Today we are seeing many of our traditions, much of our history, and many of our core values denigrated, devalued, and in some cases, simply erased. SASS stands for and promotes the preservation of those valued elements. If you think not, ask yourself why you like your SASS pards. Why do we all say you’ll “come for the shooting, but stay for the people”? It is our mission to ensure SASS continues for many, many years. Not the least of reasons is our ability to pass on the history, the values, the camaraderie and good will exhibited in our game. SASS has worked diligently to provide a sport and an organization that your entire family can enjoy together. Steeped in core values you and every member of SASS teach the young ones by example. The core qualities of free men and a free nation should not be allowed to die. Every single SASS member should be introducing friends, family, and neighbors to SASS and influencing them to join. There is strength in numbers, and the larger we are the stronger and more influential we are. Every member should swell with pride to be part of SASS. Once again, I say Thank You for all of your efforts and will be proud to shake your hand when we next meet. Great information that deserves to be published in the Cowboy Chronicle. Very nice to see such a concise list, well laid out. Well put Misty, I'll back you. Interests:Aviation, Hunting & fishing, Shooting Sports, CAD design, Metalwork, Woodwork, Computer Programming, HAM radio (KE5HFM), circuit design, Husband, father, faithful servant to my Lord. "It might be said now that I have the best of both worlds. A Harvard education and a Yale Degree! "??? "We must use time as a tool, not a couch." ? SASS means enough to me that I upgraded to a Life membership. yu bin a busy girl Misty,,,,, thank you!!! If SASS is to survive more than a few generations, it needs to look at other organized shooting sports for both positive and negative aspects. Many shooting sports are tied to and partially funded through the NRA. Other large shooting sports are organized under USPSA and NSSF. Both of these last two are main portions of the gun clubs that we frequent, especially the shotgun sports. What SASS is doing is good, but these other sports have seen growth and reduction and growth again, especially the shotgun sports. Regularly printed publications, an intention entry lane for new shooters and divisions suited to shooters who do not want to play the equipment race are critical to these sports. Cowboy action has some challenges: a second generation of leadership, a large back door as many shooters age out of the sport with fewer new shooters, a very high start-up investment, and limited control of how individual clubs provide monthly shoots. I see some problems that a smart group of dedicated cowboys need to address. Our game is too fun and the people are too nice to not get this right. First Misty very well said. I will not quote your post but know that I have read them all. Sorry this is long but as I typed more questions popped into my head. Second while some serious mistakes appear to have been made, SASS can hopefully get past them. If everything were good and SASS was a healthy organization I would continue along none the wiser. However after all that has been posted it has painfully been brought to my attention that all may not be well. So now as a stakeholder I have concerns. My concerns have a lot more to do with where all the money is going than what I am getting out of SASS. I say this because I am all for supporting a great organization as long as that organization uses my support wisely. I am not accusing you of wrongdoing so please do not take this personally. I have not been a member all that long but I do know that you just recently took over as CEO. I firmly do not believe you got SASS into this mess. However now that I know it is a mess, I have questions and you are the only person I can ask for answers. To me supporting SASS is no different than supporting any other organization, charity or cause. Use my support wisely and I am happy. But when I see the possibility that my support is not being used wisely then I start to ask questions and if I am no longer satisfied with the answers; I may decide put my support somewhere else. I am fully aware that in reality I am just a consumer and not a Member. If I were a member I would have much more say in the organization. I recognize that I have some say but it is more of a sounding board to see if we as consumers are satisfied rather than should or shouldn't we do "blank". Past Wild Bunch unilateral decisions have made this clear and while I may not like all of them; they are part of the package and I am OK with it up to a point. That said I see my self more as a stake holder in that I want to see SASS succeed. I do not believe that I have any issues with the Payroll and what the staff is being paid. I also know that there is a lot more than just base salaries in payroll. Typically for every dollar paid to an employee, there is another dollar that supports benefits, bookkeeping, taxes, and other overhead. I am willing to trust that it is fair. The staff does need to travel to perform its duties with respect to Sanctioned events and I understand that. We cut the Chronicle back to electronic. Not happy but I can live with that as we needed to save money and it is a start. However a printed publication that members could leave in waiting rooms and other places for others to read about SASS could possibly be a membership recruiting tool. Maybe some of the items below should be cut instead as the return on investment in the long may be greater with a printed publication. The quarterly paper copy may get that done. What I do wonder is, what are SASS' non-essential money drains? The SASS museum. It might be nice but I have yet to see a small museum that ever came close to paying for its self. Even if we were flush with cash, Museums are not a necessity. I hope I am wrong but I feel that it will never be much more than a road side curiosity and an expensive one at that. Founders Ranch. Answered that it is actually a gold mine. Interesting. SASS convention. Nice but this too should pay for itself or nearly so. If it doesn't, then it needs to be curtailed to the point it pays for its self or very nearly so. The administrative functions that are performed at the convention are important and the seminars are valuable. However the rest is nice to have. I have been part of several club boards and banquet committees. My experience has shown that catered events are very very expensive. Throw in live entertainment and they can rapidly become money pits. I know that the convention is now a biannual affair but if finances are so bad why not cancel the upcoming one or curtail the fringe benefits. This far out there shouldn't be a lot of non-refundable fees and it there are, do they add up to more than the money lost having it? If people want to be entertained, wined, and dined; Las Vegas is chocked full of places from inexpensive to over the top. All they have to do is decide how much they want to pay. EOT. Real nice but in its current venue unless it pays for its self it needs to be restructured so that it breaks even. Better yet why not make it a traveling venue where more members can attend it at least once or twice without shelling out a lot of coin to do so. It should be held in venues where it at least has the possibility to be a recruitment tool. As it is now it is of little benefit except to those members that can afford to attend. Lawsuit. SASS should have insurance that covers things like this. I have read almost every post and unless I am mistaken SASS is in dire financial trouble. I get that idea because your are asking for a fee increase to offset a budget shortfall in excess of $300,000. If founders ranch is a gold mine as previously stated them I am even more perplexed as to where all the money is going. I am also perplexed as not long ago I was lead to believe that SASS was 4 times larger than it actually is. There was a really big deal made of breaking 100,000 members. Instead it was really that 100,000 people had tried SASS at least once, but the vast majority are no longer paying customers for a multitude of unknown reasons. Just asking the membership for more money isn't going to save SASS because the cat is now out of the proverbial bag and no amount of stuffing is going to get it back in. Love alone will not sustain SASS. A lot of people are complaining about the $20 increase and depending on your situation it may or may not be a deal breaker. To me I see all this as an issue because of the unannounced large increase in dues with the justifications coming only after the customers balked. I am sure that many of us are concerned because we are now learning that SASS as a sanctioning body is not what we thought is was and an operating budget in excess of ½ million dollars is not enough for it to to function as a sanctioning body. I know that as a consumer I am not really entitled to answers to the above questions. However as a stakeholder I am asking them because I care about the future of SASS. Founders Ranch is a gold mine....... for the owners. You have brought up many concerns that I was thinking about as well. I believed that SASS owned FR but it looks like SASS pays a lease to use it. Now what happens if the lease was to end? All of the money spent to build and improve FR would be retained by the owners. One thing I was wondering is if the lease payment just happens to equal the mortgage payment. No numbers have been given and this has the familiarity of the "you have to pass it to find out what is in it." The math doesn't really add up for me as well. It was stated that there was somewhere over 19,000 PAYING members. Now if you were to multiply that by $65, now you really start to wonder where all that money is going. A lot of clubs scrape by and live off donated items and labor just to have a place to shoot. The last thing we need to do is squeeze them for money as well because they will have to pass that expense to the members. My earlier post in reference to JFK had nothing to do with his schooling. Someone had posted "what does SASS do for me". What do you do for SASS? a gold mine? any proof to back that up,,,,, I wudn't trade my house for one stake in FR! To her credit, when she should be telling some of you peckerwoods where to get off, she spends hour upon hour patiently enlightening you as to how good you actually have it. So we should be like you and call people names? I will also point out that you wrote this with a keyboard as well. Really? SASS is responsible for all the 125gr .357 bullets out there and the 110r 38spl Hornady Critical Defense? like Max sed,,,, who by the way is one of the most relaxed fellers I know,,,, quit yur whining and go load some ammo so you can look forward to playing again next weekend!!! if you don't look forward to playing cowboy,,, then find another sport to whine about!! Misty you are doing a great job! Running any origination with a wide range of members is a lot like "Herding Cats"
I have been involved in a lot of sporting org. and SASS is a bargain! So many on the wire are sniveling about cost and want to micro manage their dues. Wake up! Try any other sport, you will pay more and get less. SASS has become my family, and I look forward to every weekend to see them. Thanks to SASS I have made some life long friends, and have seen what true friends do for each other. When Rods house burned down an incredible amount of money was razed to help him. Nowhere outside of church would you have found that kind of support. When I was down and could not shoot, Delta and others called me "we missed you at the shoot are you OK"
1, Lifelong friends, who think like I do "or at least put up with me"
3, a chance for travel, "I try to make 4 outta state trips each year" + many clubs within 2-3 hours from home. 4, recognition from my peers. "people notice as you grow in the sport"
I wish to say thank you to y'all at SASS for your continued efforts on behalf of us, the membership, and helping us to continue playing Cowboy/Cowgirl is a safe, fun and very social atmosphere. I have been a member for quite a while and both proud and happy! I think SASS has had a very positive impact on my life! I can't begin to count the wonderful people I have met! I have made numerous good friends as a result of SASS, friends I will cherish until the end of my days. I have met all the Wild Bunch, most of the World Champions, and a lot of the SASS Scholarship recipients. everyone of them have been wonderful people who shares my views about life and values! What are these people worth to me, no value would ever be high enough for me to give up one of them! I also developed a re-need interest in shooting and a re-newed interest in the American West! I upgraded to Life Member status because of the love I developed for SASS! Sure SASS has had problems, so have I. I am glad my parents, relatives, and friends did not abandon me when I hit a bump in the road. I am glad they didn't spend time looking for reasons to criticize me! They stood by me and did what they could to help me. Well PARDS, I am going to stand with SASS until I reach the End of my Trail! I am going to do all I can to help SASS over the rough spots in the road, and all I can do to promote SASS in the future! I think it is called Riding for the Brand! Hang tough, Misty, there are a lot of us who appreciate what you are doing, we appreciate you honesty, we appreciate how heavily your wagon is loaded, and we will try to help you pull the load! THANKS SASS and all my friends for the joy and happiness you have given me! I will never forget you! Howdy; Look at my SASS number, I have been here awhile and Here I stay. Flash in the pan people have come and gone. They drive themselves away with there discontent. I always put on the match flyer that it was a "No Tears Match"
Sawyer, I'll ride right alongside you anytime. Couldn't agree more with what you said or how you said it. Misty - best I can tell, you are doing a good job and you have the support of the great majority of the members. Sooner rather than later, you need to put in place a functional redesigned business plan for sustainability, post the Founders while some are still available to assist. Seems you are trying. But it is difficult to detect progress. This is the first I've ever heard that there are PAID staff members. I always assumed this was a volunteer based club. I'm surprised that the hundreds, maybe thousands, of retired shooters who love CAS so much aren't volunteering more. You'd think there would be an army of people just lined up to get involved. I guess people are more interested in letting others do the work .... and complaining. But, as I said when this changing to a not for profit organization, who is on the Board of Directors? Is it still the Wild Bunch? True, Misty was hired as the CEO, but if she still works for the same ones that have been in charge since the inception, then what will actually change? Of the three shooting organizations that I belong, SASS cost the most. I think a small fee that we have to pay is minimal at this time for a year. It's almost the same as dinning out to a good restaurant for one night . I pride myself in finding a club with my view points and interest, everyday we finding like Misty said the core values of this great country of ours our eroding . GOD bless .